June 12, 2007, L. G. Crabo. 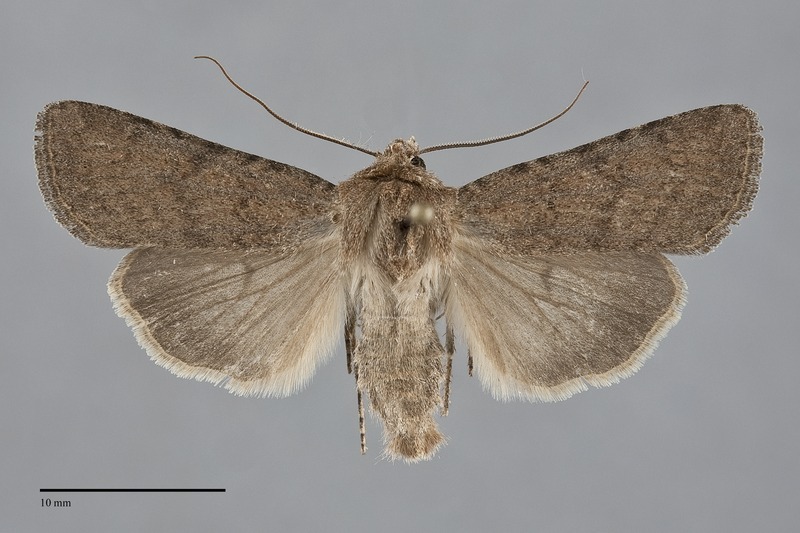 Euxoa scotogrammoides is a nondescript gray-tan to brown-gray medium-size Euxoa (FW length 15–19 mm) with a faint pattern lacking dark gray or black elements that flies east of the Cascades during late spring and early summer. 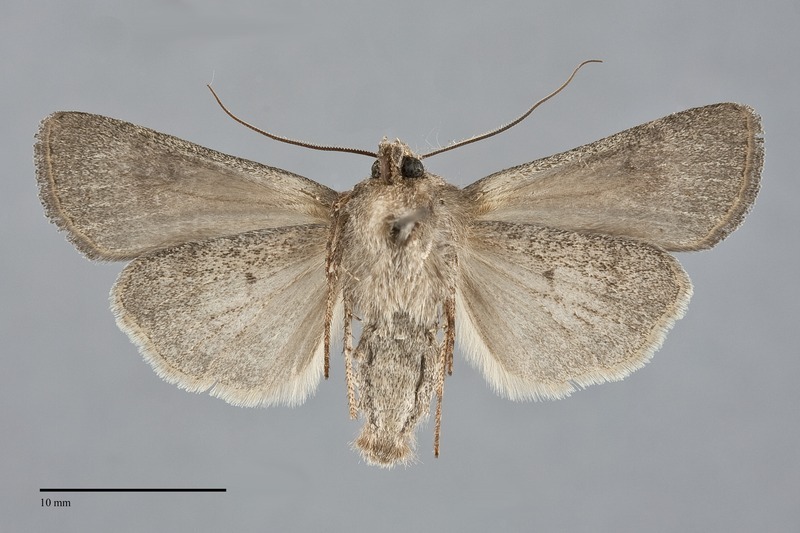 Most populations of this moth are grayish tan, slightly darker gray along the costa and near the outer margin. A population from southwestern Oregon is darker brown-gray and slightly larger than other populations from our area. The terminal area is darker than the rest of the wing, but usually not as dark as the shade preceding the subterminal line. The basal, antemedial, and postmedial lines are gray-brown, double filled with slightly lighter shade of the ground color, darkest on the costa and variable in darkness on the rest of the wing. The basal line is inconspicuous or evident as spots on the costa. The antemedial line is usually patchy, occasionally complete, slightly irregular and angled slightly toward the outer margin. The median line is gray-brown, usually faint but sometimes as dark as the shade near the subterminal line, weakly excurved. The postmedial line is toothed on the veins when evident, nearly straight across the wing near the reniform spot and angled toward the base below the level of the cell. The subterminal line is pale, patchy and incomplete, preceded by a dark gray-brown shade. The terminal line is thin and faint. The fringe matches the terminal area. The orbicular spot is absent or a small pale spot. The reniform spot is weakly outlined in pale scales and is filled with gray-brown. The claviform spot is absent. 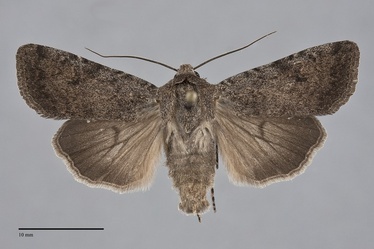 The hindwing is gray-tan, darker brown-gray in the southwestern Oregon population, with slightly darker veins, discal spot, and terminal line. The hindwing fringe is off-white with a variable darker base. The head and thorax match the forewing. A frontal tubercle is present. The male antenna is biserrate. Euxoa scotogrammoides is a member of the subgenus Euxoa. This species can usually be recognized by its early flight season for a Euxoa, pale gray-tan color, and relatively faint pattern that lacks strongly contrasting dark gray or black elements. Absence of the orbicular and claviform spots and dark filling of the entire reniform spots are also typical. It is most likely to be confused with Euxoa comosa, a common variable species, and Euxoa altens which is limited to high elevation forests. Euxoa comosa usually has dark transverse lines and a pale-rimmed orbicular spot. 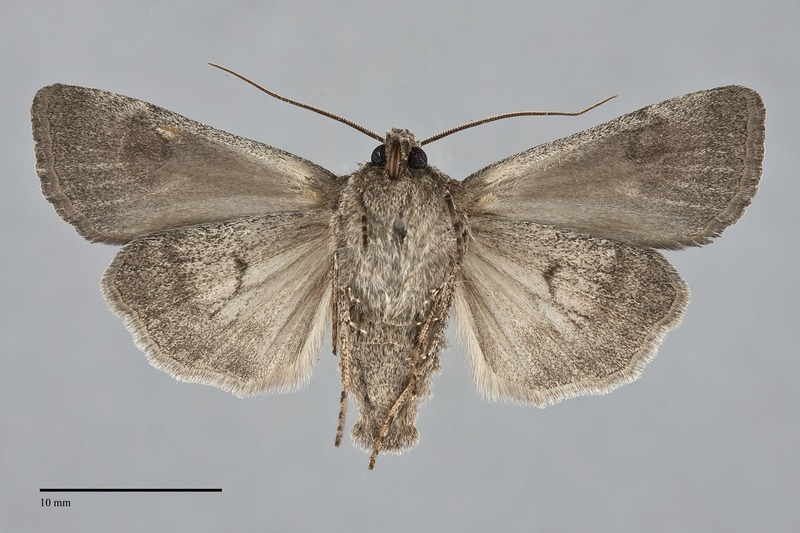 Euxoa altens is darker gray-brown, has pale filling of the reniform spot, and a smoother subterminal line than E. scotogrammoides. The pattern of E. scotogrammoides is similar in Euxoa tocoyae, a member of the same species-group, but it is orange-brown or slightly reddish instead of gray-brown. This moth is variable in our region. A distinctive dark brown-gray population occurs in the Siskiyou Mountains of southwestern Oregon. This species is endemic to dry forest and rangeland habitats in the northern portion of western North America. In the Pacific Northwest, it is mostly confined to dry grassland and sagebrush steppe at low elevations and is only rarely collected at higher elevations. A disjunct population occurs on barren, rocky serpentine ridgetops at high elevations in the Siskiyou Mountains of southwestern Oregon. Euxoa scotogrammoides is found in the dry interior of our region as far north as southern British Columbia and east to western Montana. It also occurs on dry serpentine ridges at middle elevations in the Siskiyou Mountains of southwestern Oregon. The range of this species extends south from our region to north-eastern California, northern Utah, western Colorado, and northern New Mexico. 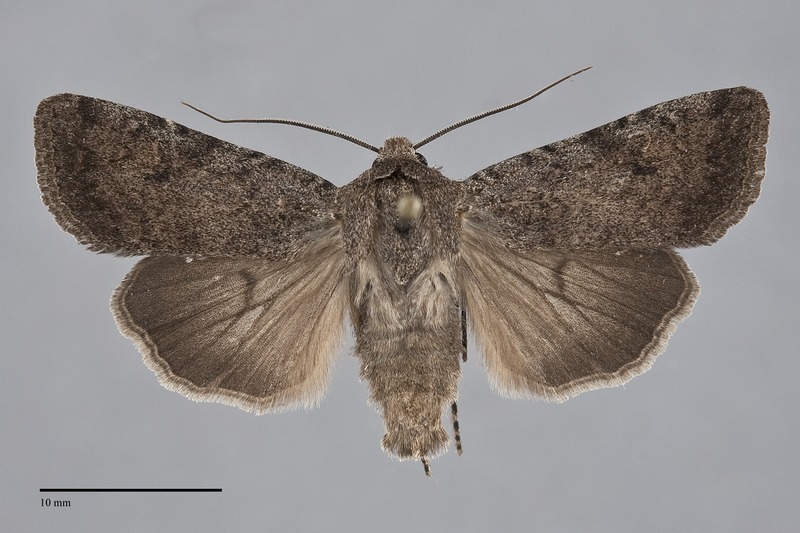 This species flies relatively early in the year, usually beginning in late spring at low elevation and later in the summer at higher elevations. Records for our region begin in mid-May and end in mid-July. This species is nocturnal and comes to lights.